Prog may not have given birth to the rock “supergroup” but there can be little doubt that the notion of constructing a band out of individual members, each of whom has already achieved rock and roll notoriety has found a particular home in the prog genre. From Emerson Lake & Palmer to Transatlantic, prog is a genre that has often defined itself by the virtuoso playing of its musicians. This inherently lends itself to the “supergroup” concept where it is the musical reputation of the individual components of the band that is the band’s raison d’etre. The latest entry in the prog-related supergroup sweepstakes is Flying Colors, featuring Mike Portnoy and Neal Morse (both of the aforementioned Transatlantic), Steve Morse and Dave LaRue (both best known for their work in the Dixie Dregs) and newcomer Casey McPherson (of the late lamented Austin band, Endochine). As with all supergroups, one piece of the Flying Colors story is its origin. 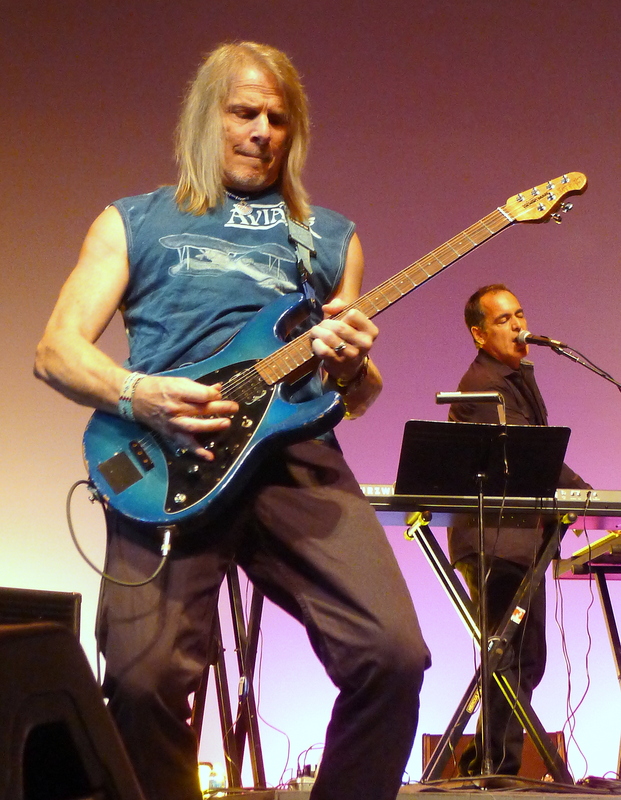 Steve Morse: Bill Evans [the band’s executive producer] got in touch with me and asked me if I’d heard of Neal Morse and I told him “yes, I have heard of him and everybody’s been asking me why I don’t record with him… and I don’t even know him. So I worked with him, I worked with Mike Portnoy and I worked with Kerry Livgren and, you know — just the idea of writing with Kerry and Mike and Neal, just that alone was enough to sell me on the deal. Unfortunately, Kerry had a health problem — a very serious problem — and so he couldn’t join us, but then, before then I said, “Can I at least meet Neal? And let’s work together. See if we’ve got a good chemistry” and we did and it was like, you know, Mr. Instant Music. 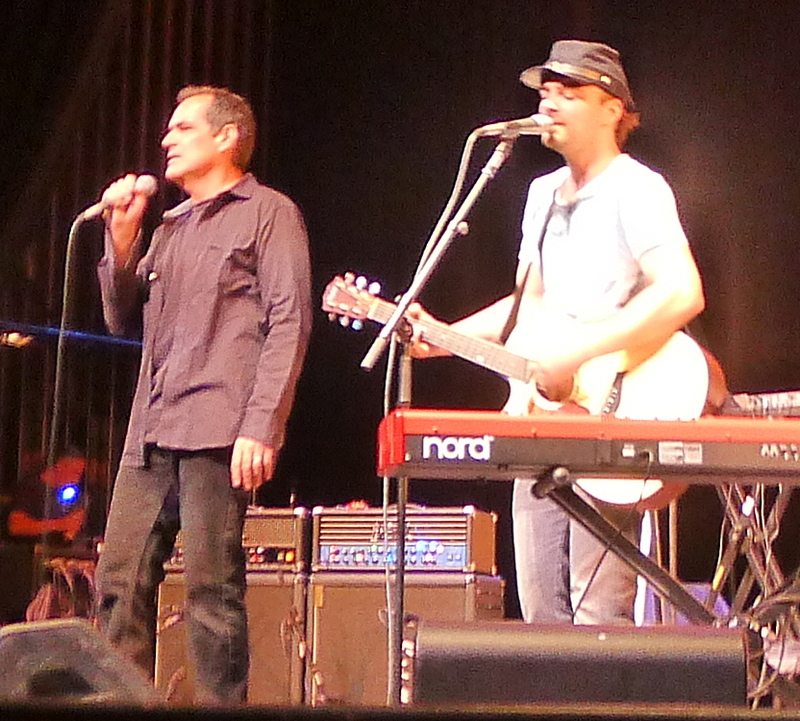 Neal Morse: That’s him, actually. Casey McPherson: They found me on Craigslist. If, at first blush, the idea of another prog supergroup featuring Mike Portnoy and Neal Morse does not yield discernably turgid results, you are not alone. 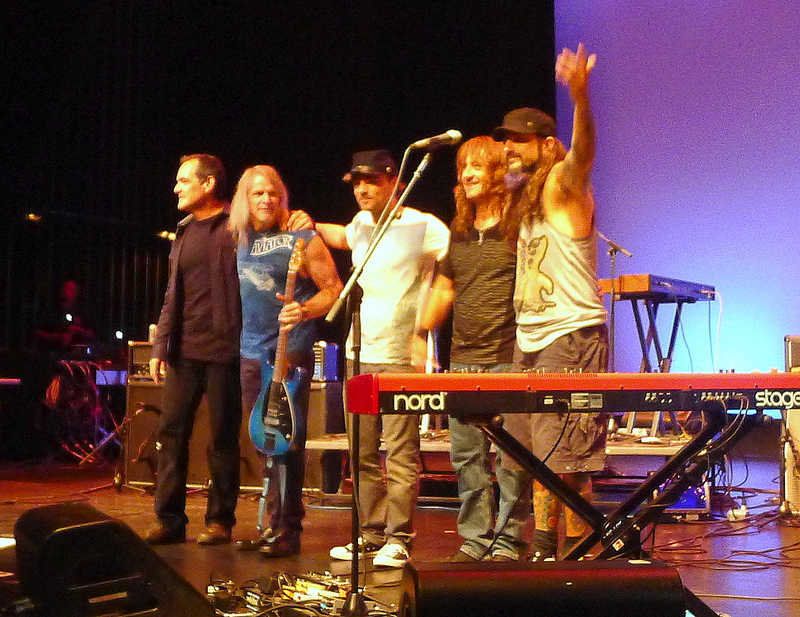 There’s already Transatlantic…and Neal Morse’s band…and Yellow Matter Custard. 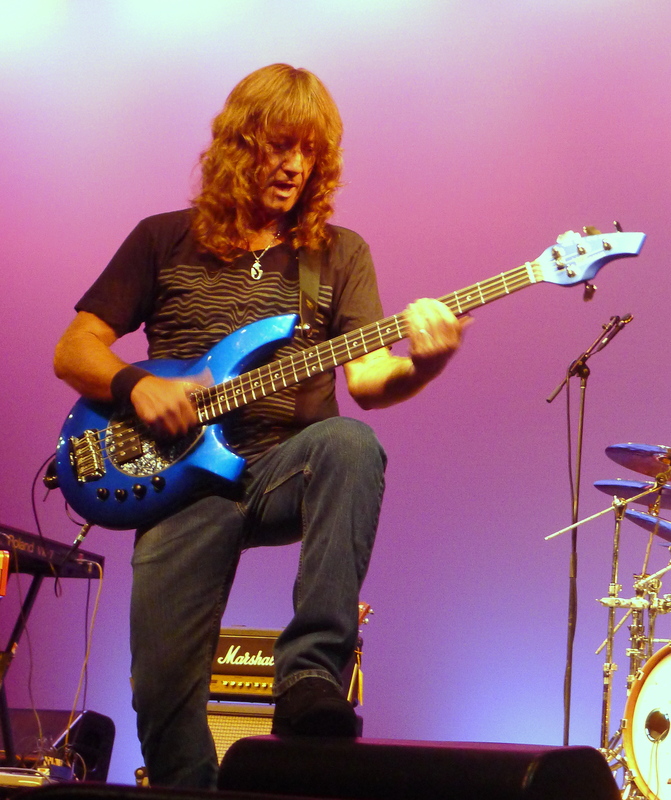 But Steve Morse isn’t in those and neither is his fellow Dixie Dreg, Dave LaRue. And who IS Casey McPherson? That was my initial chain of thought. A moment later, it occurred to me that the idea of two Dixie Dregs and two members of Transatlantic working together was exciting. And who IS Casey McPherson? And that led to an odd thought: perhaps it isn’t going to be exactly prog. The Dregs always were odd ducklings within the world of prog, existing there almost by default. What else could one call the band’s omnivorous approach to music, decidedly rock, supremely musical, almost jazzy but with a southern fried approach that rendered futile its attempts to drop the “Dixie” from the moniker? And suddenly the determination to figure out who in the hell Casey McPherson was took on added urgency. A trip to YouTube and recourse to the Oracle of Google uncovered gems such as “Music to Drive and Cry To” and “Can’t Find a Way” and revealed a now-defunct Austin band called Endochine that spun a sound that I could not help but compare to Bends/OK Computer vintage Radiohead with more than a little Jeff Buckley bubbling up in the mix. This, I thought to myself, could be good. And not in a Portnoy/Morse supergroup sort of way. It could just be…good. MAG: ‘Cause I’m looking around this room and I definitely think that, you know, there just weren’t enough songwriters in this band. Clearly, the biggest problem for Flying Colors was not figuring out how to get a song written. It was not looking around the room wondering who would step up to the plate with some ideas. That’s never a problem when Neal Morse is in the room, nor in any room containing Steve Morse or Mike Portnoy. And Dave LaRue is no slouch. From the evidence of Endochine it was hard to imagine McPherson would be devoid of ideas…though whether he’d have the huevos to speak up in that crowd was another question. 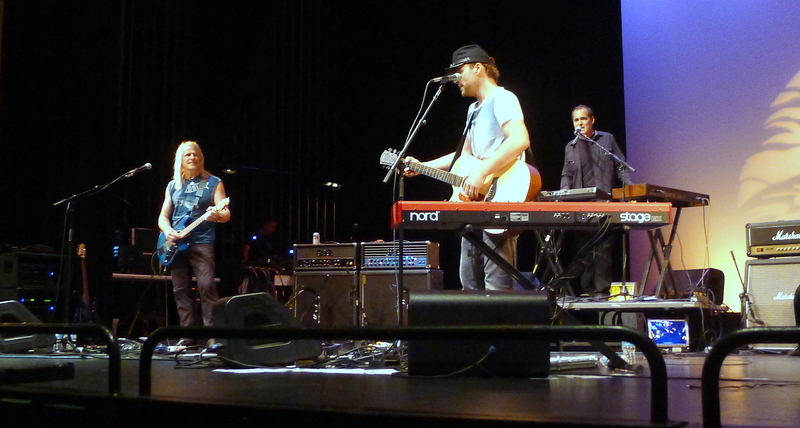 The writing process for Flying Colors’ debut varied from song to song with each of the chefs alternating stations and bringing different spices to the soup pot. Early on, the Morse non-brothers jammed with the tape running. These streaming recordings were the first things Mike Portnoy heard. The first bit to receive the full band treatment was the nugget of a song idea brought to the party by Casey McPherson that turned into “Kayla,” an utterly infectious, total ear worm of a song. Surprisingly, given the seeming assertiveness of the chefs, only one song – the twelve minute proggy suite, “Infinite Fire,” contributed by Steve and Neal Morse – was brought to the sessions in anything approaching nearly complete form. Hard as it may be to believe, there was not a single song on the album that was not touched – from a writing standpoint – by each of the band members. MAG: Well what I’ve always heard, Neal, both with Spocks and Transatlantic, is that you come to the writing sessions with nearly complete songs that, you know, everyone says, “Yeah, we can take that and we can maybe just tweak it…” and then everyone adds a little bit to it, but the end product greatly resembles what you came to the sessions with — a demo that maybe with a different band, might be recorded exactly as is. Neal: Yeah, sometimes, you know. With this thing, I tried that with a couple songs, actually, but it just didn’t seem to work. It wasn’t the right thing. And there were also a lot of songs then, also, that just happened very spontaneously in the room. If there is one characteristic to the rock supergroup other than the pre-existing success of its component members it is this: supergroups tend to be relatively short-lived “projects” rather than day-job bands. For every ELP there are far more Blind Faiths or UKs – star studded lineups that put out very few albums. The very thing that makes a supergroup what it is – the fame of the members – has as an almost necessary side effect – great demands on the time of those members. In this, Flying Colors is no exception. 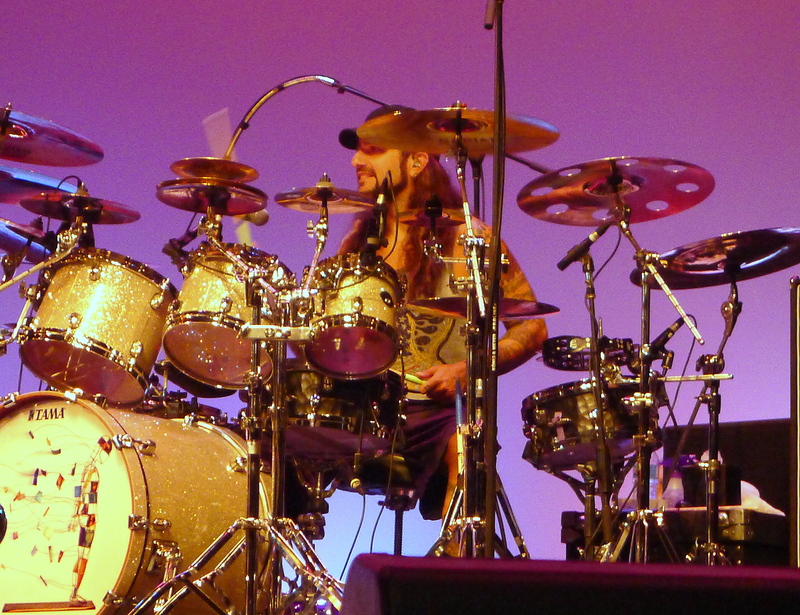 Mike Portnoy has seven ongoing projects – though he was rather shaky on the count. 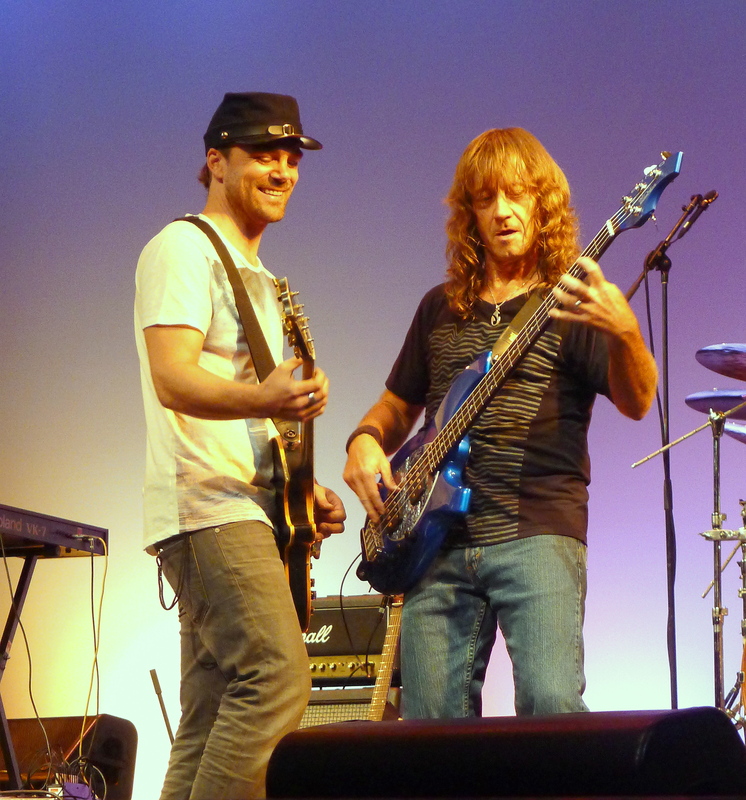 Dave LaRue and Neal Morse have at least four projects each and Casey McPherson and Steve Morse mentioned at least three projects each. That is over twenty projects between the band members. Needless to say, scheduling anything requiring all band members to be in the same place at the same time – much less for an extended period of time – is a difficult feat, if not a minor miracle. MAG: Why only two gigs in the U.S.? Steve: We had one in St. Louis and everybody could drive there…but time, yeah, time is tough. You see, with, to do a tour, and especially in Europe, they want like six months in advance. Okay, there’s say seven bands between us. That we’re all working with, that we, that’s our job. Dave LaRue: It’s kind of like winning the lottery. Steve: Yeah, if you have 200 people in a room, statistically, two of them should have the same birthday, according to the odds, or something like that. The odds of us being able to do a gig at all [laughing] precedes these quite a bit. Mathematically it’s incredible how hard it was to do. The scheduling issues were a factor in the compressed time frame in which the band recorded the Flying Colors album. The band convened for the grand total of nine days to write and record their debut. While they had exchanged tapes ahead of time, and while the two Morses had the opportunity to work together initially, the only time the entire band was able to work together was these nine days. For Portnoy and Neal Morse this was not exactly a new experience. Three times Transatlantic had done just the same in order to produce the three Transatlantic albums. 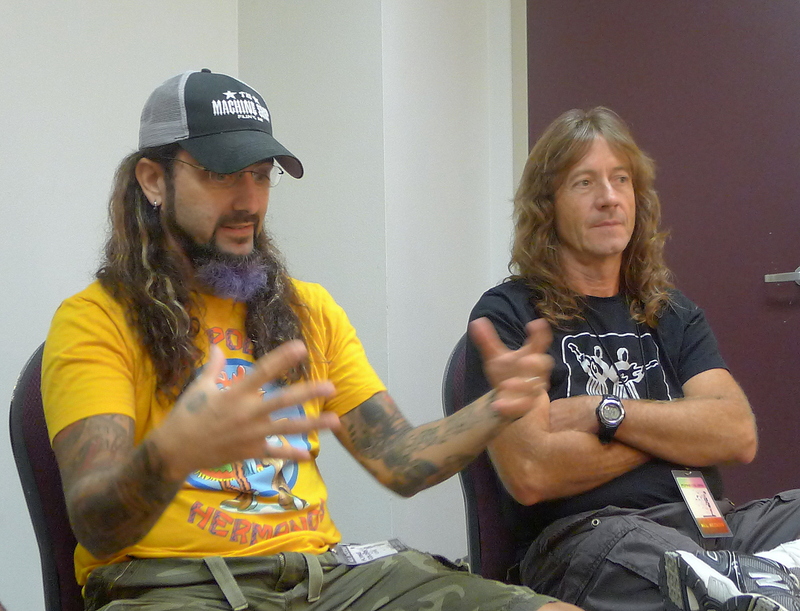 Of course, as Portnoy points out, with Transatlantic they do not do most of the writing on the fly and in the studio. Most of the songs stem from relatively complete Morse or Roine Stolt demos. And yet, nonetheless, three times at least one member of Transatlantic expressed the sentiment that it would have been nice to have been able to work at a less breakneck pace. In the end, what came out of Flying Colors’ nine days in the studio were demos of the entire album with final drum tracks. The final versions of each musician’s input was recorded by each of them separately at their home studios. MAG: What is the role of live music in today’s music world? Dave: There’s a role of live music in today’s music world? Mike: For a lot of people, it’s a financial necessity because nobody’s making money selling records anymore, so a lot of bands, the only way to make money is to go on the road and even there it’s hard in this climate. Casey: Yeah, one of our agents was saying it’s harder to make money and get gigs now because everybody’s on the road now, all the time. More than they used to be. Steve: Well the competition may bring the guarantees down but at least the expenses are coming up to compensate. The logical extension of the scheduling problems so endemic in supergroups is, of course, not working together. The stated intention of all of the members of Flying Colors is that their debut album not be a one off. Whether that will happen will likely have more to do with scheduling than it with will – or, for that matter, market. Despite initial cynicism about “another prog supergroup with Mike Portnoy and Neal Morse” reviews have been good. The album appears to have sold well, charting in Europe. There was plenty of demand for the live product. There would likely be similar demand upon the next go around. But with Mike Portnoy in a career transition that he is clearly relishing the likelihood is for more projects rather than less. Frankly, the future of none of the other Flying Colors band members would appear likely to involve a shrinking number of bands and side projects. It is not remotely difficult to imagine those factors – and others – resulting in a debut as promising as that of Flying Colors’ not being honored by a sophomore effort. On the other hand, none of the members of Flying Colors has a pure day-job band with a clear and long-term future which they themselves do not control. While none of the band’s members suggested an intention that Flying Colors become that sort of band it is certainly a choice and a commitment they could make. The potential is there. 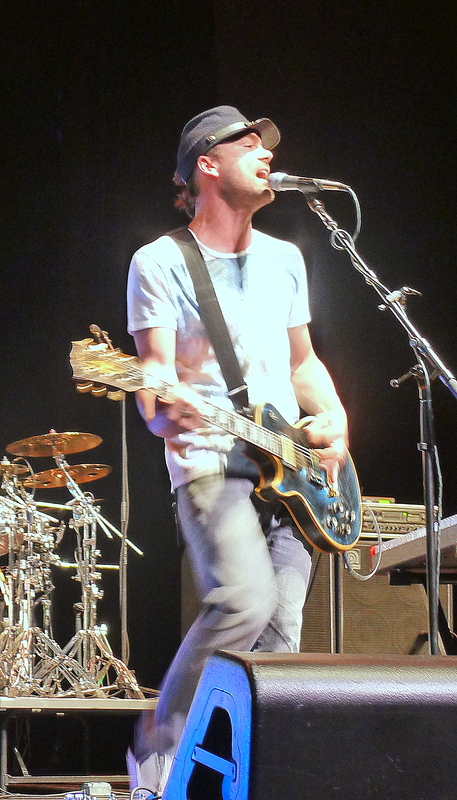 The band’s sound incorporates aspects of the Transatlantic Third Wave-style proginess (prominently featuring Neal’s signature madrigally bits and the Beatlesisms in which he and Portnoy so revel), the Dregs’ omnivorousness (prominently feature Steve’s glorious, exuberant and supremely musical guitar runs) as well as a distinctly modern sound brought to the table by McPherson. It is not prog though it is proggy. It has a built-in audience because of the members’ resumes but is not, necessarily, limited by them. Or it could all go away tomorrow like so many “supergroups” that could not quite capture as must interest from their members as from their fans. Which of these roads the members of Flying Colors choose will determine whether the band will be remembered alongside ELP…or Yoso.